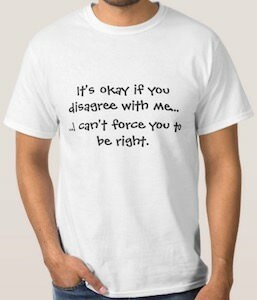 This t-shirt is here to show the world that you are always right and that it is OK if you others don’t agree with that. On this white t-shirt is simply says “It’s okay if you disagree with me …. I can’t force you to be right.” and that is a clear message. Sure it does say that you are always right but if you are then it is not a bad thing to wear this t-shirt. And this shirt also makes for a fun present for someone that always thinks he is right. This t-shirt is available in sizes Small – 4XL and they are made from 100% cotton.